The word “Dare” itself signifies that if you dare for something than you can do it. If you do not dare you cannot do it. Just thinking over a problem is not going to help, we have to take action because without our “Action” nothing is possible. We need to think about the existing problem and not hold it as others responsibility but our own responsibility and take appropriate actions to solve it. We are aware of a lot many things and a lot of people are aware of it but then what are we or others doing to sort out the problem or solve the problem ? If nothing then take a step and think over it and act on it. I would say that it starts with day to day activity where we have to “Dare” to bring about a change or the same thing carries on for ever and ever. For example if someone misbehaves with us everyday and we cannot take it any more than we dare to act or else the same thing will carry on for ever. I would like to cite example of G. Shree Vidya, an women Entrepreneur of Ravindar services Pvt ltd who had to go through a very tough phase, but she passed through it and established a business which is dominated by male. She runs a business of providing security services to people. She says if you cannot become a cop become a “Security Guard”. A well built up lady having a good background. Her mental agony started when she could not satisfy dowry hungry people and they tried to burn her. She sustained 40 % burns and left the home with her 2 daughters because she had no other option but to leave the home and make a living for her own self because she could not return to her paternal home too. She started with housekeeping job and that is the time she realized that market had good potential for security services. She started providing security guards to home, offices etc. She had to manage them and get the work done. She used to make surprise visits at night to check the honesty of her staff. She used to carry chilli powder with her during night visits. She had to sack, scold and discipline untrained male labourers, because of this she used to get blank and threatening calls from them. G. Shree. Vidya could do it because she was determined to run the security services business. She could have fallen weak and left everything in between thinking it was not her cup of tea and she should try her hands at something else but she did it and is still doing it because she “Dared” and if you can dare you can do it. Most of the time we fall prey to others beliefs and thought process which rules our decision and we think on those terms without realizing that it is another persons opinion about us and not our own opinion. Our thought process gets paralyzed and we think what the other person is saying is correct and do not apply our brain. I would request every individual to apply our own brain and live our lives so that we are aware of our own potential and our own capabilities. When the other person will see it in you he will support you but that is only possible when you try and do it instead of others judgements and opinions. It really gets difficult convincing someone that we are capable of doing something until and unless we do it and succeed at it. I would say have faith in yourself and take the steps which are necessary to take you forward either in personal or professional life. You have to take a decision and dare to move on in life or you get struck and spend the whole life living in your comfort zone. Dissatisfied with the present job look for a new job, want to start a business do it. Until and unless you do how can you understand whether you will be successful in it or not. When you try your hands at something then you understand your capability. Don’t let others judgements and opinion govern your life because it is your life and you are the creator of your own destiny. Thinking is important. Until and unless we think we cannot do so we need to think and act accordingly. You can take suggestions from people but let the last and final decision be yours. Faith on our own selves is very very important because if we do not believe in ourselves we cannot do it because self doubt will never let us dare and do something which we thought to be impossible. When we dare we do things which we previously thought to be impossible and set new benchmarks and standards for our own selves. To do something we have to move out of our comfort zone and give away with few luxuries of life which kills our time and hampers our productivity. We should be ready to change and take in new things, new challenges and ready to accept the new life with new thought and vigor. This needs few sacrifices at personal level but when we are mentally prepared we can do it and also adjust to our new life and new environment. There may be few setbacks at the start when you start something new. No one will support you and you are forced to manage everything on your own. Do that, do not leave things in between, struggle because it makes you tougher and stronger. This constant struggle and determination will help you succeed and no one can take your success and glory from you. Take decisions in life because taking decisions are very important. This whole world is full of examples where a person could achieve something because he dared to do it. While choosing a career option we think a lot and consult everyone. But if no one agrees with our decision we feel alienated. We can move on with our decision and work hard to achieve our goal but then it takes lots of guts to do that. You take a decision in spite of opposition from all sides but then if you believe it you can do it. Our thoughts and feelings mould our life and it only comes with taking few important decision and some risks in life. The hardships which we bear helps us mould as a person, it creates a new me who is more capable than before and more confident than before. We get diamonds from coal mines. Coal which is subjected to extremes of temperature and pressure converts into diamond while the rest of coal remains as coal. The diamond though being a precious stone will not shine until and unless it is cut into shape. It means though we may have lots and lots of talent we cannot do wonders if we do not take an initiative and work hard. We have to be a self starter. We see lots of problems existing in the society but how many are there on which we dared to act and solve it. There are few and many more left to be addressed but if we take those in our own hands we can do it and then there is no looking back. We have to do this taking it as a social responsibility. We might not be covered in newspapers but when we take an initiative things do happen. I would say we make them happen. Our daily problems and sufferings will end only if we dare and try to end them or it will continue for ever. There are many things which happens in our day to day life and we feel there is something wrong with it. If you feel it is wrong go ahead with it and do something rather than just complaining and joining the masses which do the same thing that is complain. 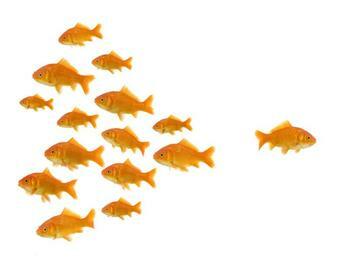 Be different from the rest. Try to sort out the problem rather than just complaining. Help others in solving the problem and coming up with the solution. Let it be our problem not yours or mine. Let us dare and create a new society where we all live in peace and harmony. A new me who is different and not afraid of uncertainty but looks towards a new beginning.